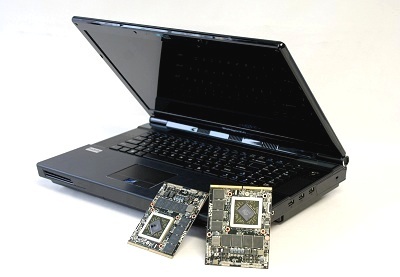 Eurocom now offers the new AMD HD6970M GPU in their EUROCOM Panther 2.0. The EUROCOM Panther 2.0 is the most powerful Mobile Workstation on the market and offers the ultimate combination of performance and portability to both gamers and professional users. By adding support for the Radeon HD6970M in the Panther 2.0, Eurocom increases the already impressive configuration options which includes NVIDIA GeForce and Quadro series graphics cards running in both SLI and CrossfireX configurations. To coincide with Eurocoms tradition of offering the best possible technology, only the highest performing AMD GPU was chosen, the AMD Radeon HD6970M. The EUROCOM Panther 2.0 supports overclocking in the HD6970M to allow even more extreme performance. EUROCOM Panther 2.0 provides the ultimate combination of power and portability with up to 3.25TB (Terabytes) of storage with four internal physical hard drives and RAID 0/1/5/10, super-powerful 3.33 GHz Intel Core i7 Processor Extreme Edition i7-980X; or 3.33 GHz XEON X5680 processors running at 6.4GT/sec, Gigabit Ethernet port on-board, HDMI in and out ports, eSATA, DVi Dual Link port, with a 17.3″ Full HD 1920×1080 LED backlit display and full size keyboard. Now with the option of equipping this unit with up to two high-performance Radeon HD6970M VGA cards in CrossfireX mode will give any gamer or professional the graphical performance they have always dreamed off. Eurocom (www.eurocom.com) is the world's leading developer of desktop replacement and mobile workstation technology. Eurocom began with the goal of creating the most advanced computer systems and using advanced engineering techniques typically unseen in the computer industry. The company has produced many firsts and continues to engineer well-balanced machines that inspire and enable individuals to reach great possibilities. Eurocom has made its reputation in the computer industry by offering the most advanced Mobile Workstations and Mobile Servers available. The company was founded on the belief that it could revolutionize the PC world with advanced Mobile Technology, with designs and advanced engineering techniques typically unseen in the computer industry. Eurocom continues to engineer well-balanced, state of the art machines and VGA solutions that inspire and enable individuals to reach great possibilities.